A portico is typically found at the entryway of a home, some extending out just a foot or two and others covering much of the front walk. Porticos provide shelter from rain, sun and other elements, often extending the life of the doorway, while also offering the homeowner a near limitless range of design possibilities. Although professionals are commonly hired to construct porticos, a homeowner with the proper tools, materials and building savvy can do the job himself just as well and at a fraction of the cost. Porticos often provide a stylish accent to homes. Determine the desired height and width of the portico. Measure and mark where the front posts are to be placed. Also ensure that the cement slab being used as a foundation is level. If not, one of the posts should be trimmed so that the roof will be level. Prime and paint the bottom of each post to protect against moisture. Once the paint is dry, add screening material using roofing nails. Then use 2-inch screws to attach aluminum base stands to the bottom of each post. Pre-drill holes in the concrete slab base using a masonry drill bit of 5 3/4 inches. Then attach the post anchors to the concrete slab using masonry screws. The posts can now be attached to the post anchors using 2-inch screws. Measure and cut a trim board so that it reaches one inch past the posts on either side and creates a small overhang. Secure the trim board to the posts using 2 1/4-inch screws. Attach 2x6 and 2x2 pieces of lumber with sixteenpenny nails in order to create a header. Create a ledger board the same way. Attach the header to the trim board and the ledger board to the house using lag screws in both instances. The location of the joist hangers must be marked on the ledger board. Firmly secure the joists with joist hangers using all supplied holes. Then nail a 2x6 piece of lumber to the end of the ceiling joists to create a ledger for the rafters and attach it to the house using lag screws. 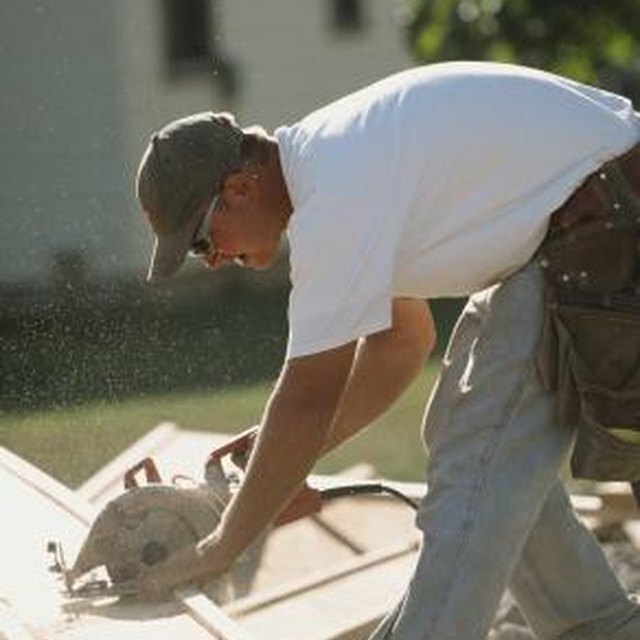 Measure the angle of the roof pitch and cut the first rafter angle with a circular saw accordingly. The initial rafter can then be used as a guide for subsequent rafters. Attach the rafters to the header and the ledger using sixteenpenny nails. Place a double layer of plywood sheathing down perpendicular to the rafters so that it is flush on the sides with the one-inch overhang in the front. Secure the sheathing to the rafters using eightpenny nails. Then add roofing felt secured by roofing nails. Begin laying roofing shingles in an overlapping fashion from the front edge of the roof, working your way back to where the roof meets the house. Cut flashing that matches the portico's length along the house and install it over the last row of shingles. Then cover the flashing with another cut layer of shingles. Use a pneumatic nailer to attach a piece of plywood sheathing to the underside of the joists, which will function as the portico's ceiling. Also add a piece of plywood trim to the beam right beneath the roof's overhang. Add a soffitt to permit airflow, and then attach the fascia to the front part of the roof. Also, add trim to the exterior side of the roof and the inside in order to cover the side beams. Attach siding to the sides of the portico roof using studs and then paint the siding to match that of the house. Prime and paint the ceiling, posts, soffitt and fascia so that it corresponds with the house's trim. Choose posts, siding and roofing shingles that are consistent with the overall look and style of the home. Once the portico is built, accessories can be added such as rafter lights, latticework walls and wraparound flower boxes on the wood support beams. In addition, proper maintenance can help extend the life of the portico, including the application of water seal to exposed wood components at least once a year. The entire building process takes approximately two days to complete at an average cost of $500 to $1,000 as of publication, and requires some mildly strenuous physical activity. People who live in areas of the country that are often subjected to strong winds should reinforce the portico frame with hurricane clips. Also, those installing rafter lights should consult an electrician first. CostHelper.com: How Much Does a Porch Cost?